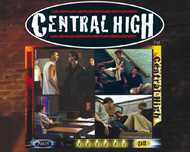 For grades 7-12, "Central High" is a software program that combines video and audio to form an interactive multimedia tool designed to teach students alternative ways to handle real-life scenarios. The multimedia format meets goals in the areas of violence prevention, ethics, and morality by providing an effective means to reach today's students. It's a positive influence on behavioral development, communication, and personal life management skills. The player helps Kevin, the main character, make constructive choices through a series of scenarios involving daily life choices including bullying, cheating, drugs, drinking, driving while intoxicated, as well as personal and peer conflicts. It teaches violence prevention and personal life skills. The player takes on the role of Kevin, a teenager living in a bucolic suburban town. Kevin has, for some unknown reason, been selected to save the world from an equally vague fate at the hands of some angry but unseen aliens. Each decision he makes in the course of six days will help decide the future of his fellow Earthlings. As Kevin, you face hundreds of questions throughout the week, ranging from whether to eat a salad for dinner to whether to talk back to your teacher and whether to steal Dad's car. It's a kind of choose-your-own-adventure for moralists: make the wrong decision and a little yellow light on the bottom of your screen comes on. Once six lights go on, you lose; you have to start over again if you want to save the human race. Whether the lights go on depends on a complicated point system in which the worst decisions cost you 16 points and the best cost nothing. Despite Kevin's apparently idyllic life - a nuclear family, including a sister nicknamed Squirt and a dog called Max - the teenagers around him are a messed-up group. There are bulimic girls, insecure bullies, suicidal adolescents and (this being a post-Columbine game) a few trod-upon Goth kids for good measure. For additional points, Kevin has to steer them all toward the righteous path, demonstrating what the instructions describe as the "11 strengths": integrity, honesty, responsibility, respect, self-discipline, compassion, tolerance, kindness, caring, courage and commitment.